The Carro Veloce L3/33, also known as the CV-33 was a tankette produced by Carro Veloce for the Regio Esercito beginning in 1933. The design was an adaptation of the British Carden Loyd tankette, which had seen wide success on the international export market and became the basis for a number of similar tankette designs throughout the 1930's. Because Italy lacked the industrial base to produce large numbers of more complex and advanced tank designs, the L3/33 and later L3/35 tankette formed the backbone of the Italian armored corps and became the most widely produced Italian armored fighting vehicles of the war, seeing service from the Italian invasion of Ethiopia to the very end of WW2. Several variants were produced, including a flamethrower variant (the L3/33 FL, standing for "Lanciaflamme"), a bridge carrier variant and a command radio variant. 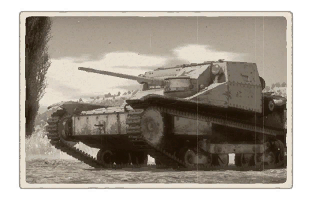 As the war progressed, and the Italians faced the Allies in France and North Africa with their more heavily armed and armored tanks and long-range anti-tank guns, the deficiencies of the L3/33 and 35 became apparent. Although fast and possessing a low profile, it was too thinly armored, capable of only withstanding infantry rifle caliber munitions. In addition, its standard armament of a 6.5mm machine gun proved inadequate for long-range combat or engaging other armored vehicles. While the Regio Esercito began slowly upgrading its armored units to more modern standards, stopgap solutions to make up for the difference were considered and adopted. One of these was to mount a Fucile Controcarri S Mod.39 (20 mm) in a small number of L3/33's and 35's, replacing the 6.5mm machine gun and creating an ad-hoc tank destroyer platform. These were designated as the L3/33 CC, which stood for "contocarro" ("anti-tank"). Arriving too late to see action in Libya before the Axis retreat, they saw only limited action in Tunisia. Gradually, the L3/33 and L3/35 would be withdrawn from front line service, serving largely in behind-the-line roles such as artillery towing vehicles and police vehicles in Axis-occupied territories.